Quintegra Solutions Ltd., (NSE: Quintegra; BSE: Quintegra, Scrip Code: 532866), a global IT services and Consulting Products company, is one of India’s leading software developer and IT services exporter. Quintegra has offices in the US, UK, Germany, Africa, India, Malaysia and Singapore, with development centers in India, Singapore and Malaysia. Leveraging its proven global delivery model, Quintegra provides a full range of custom software development solutions and consultancy services in IT on various platforms and technologies. Quintegra’s software development processes meet the highest quality standards and its software processes comply with SEI CMM standards. Quintegra enjoys long-term business relationships with clients across diverse sectors including some of the best-known global corporations. Quintegra also works closely with many mid-size growth companies and ISVs. 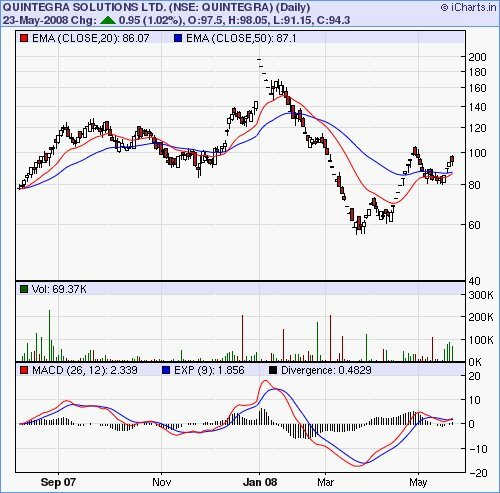 Quintegra is headquartered at Chennai, India, and is listed on India's NSE, BSE and MSE. More Recently Quintegra has completed the Initial Assessment of ISO 27001:2005 Information Security Management System of the organization with an external agency.On its quality journey, Quintegra has also completed its SCAMPI B assessment with an external auditor and is moving closer to become a CMMi Level 5 company. against Rs. 2.86 Crores for the same period during the previous year posting an increase of 92.65%. On a stand alone basis, the Company has recorded a top line growth of 47.78% for the Fourth quarter ended 31 March 2008. The Company’s stand alone revenue for the fourth quarter ended 31 March 2008 stood at Rs. 25.67 Crores as against Rs. 17.37 Crores for the corresponding period of the previous year. The Net Profit for the Company on a stand alone basis for the fourth quarter ended 31 March 2008 was Rs.2.77 Crores as against Rs. 1.99 Crores for the same period during the previous year posting an increase of 38.64%.